Just a reminder that this museum closed down in 2011 and sold all the cars to the Dezer Collection in Florida. And I just want to add that the information I sent was correct at the time I posted it in December 2009. I have. In the work place of a Lotus dealer. It's small. Looks old, but also expensive because of the materials used for the interior. It was a small sports car. Approximately 12 000 were made. It's not that cheap nowadays, and if you want to own one, I would advise you to steer away from it if you don't know anything about mechanics. 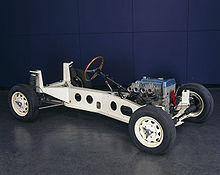 It is handy of you can do some jobs on this kind of cars yourselves, nowadays. I've once seen one in a garage, and the dealer told me the owner wanted to drive with it to the south of France, and to spend his vacation over there. That to give you an idea about the fragility of this kind of cars. Moreover, they aren't safe to drive. You would get squashed against the backbone, because you're sitting beside it. I would like to get the chance to drive it once, preferrably on a circuit; but I don't think it would be very amusing to own one because of the frequent mechanical problems such an old car would run into nowadays. A Mazda MX5 is a good alternative. Yes, I know, it's Japanese... What happened to British car manufacturing? Until 10 years ago it was rather easy to find and buy one, but nowadays it has become difficult, and they have become expensive, unlike 10 or 15 years ago. 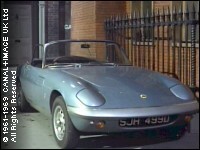 As long as it was well maintained, a car like the Lotus Elan shouldn't present too many problems to run, as it's actually quite simple mechanically. The fibreglass body is fragile though, and probably less easy to repair than a metal one. Many classic cars are still around because they are much simpler to work on than modern vehicles, which have complex electronics and elaborate mechanical components. They may be more comfortable and safer - but they're much less fun ! As long as it was well maintained, a car like the Lotus Elan shouldn't present too many problems to run, as it's actually quite simple mechanically. I agree, there are still a few on the roads and many of them make the bi-annual trip down to the Le Mans Classic. It seems strange to me to read people say they've never seen one, here are a couple of pictures taken this morning at my local pub where classic cars meet every 1st January. As so often, top is much prettier than bottom. You don't see many hardtop versions, which look rather different - more European somehow. I spotted a few at the Brooklands classic car meet yesterday as well, plus a number of Steed style Bentleys. This has come on eBay and I'm very tempted. One bid of £30 so far. There's a few Avengers cars like this floating around ebay. Not official releases, but something certain buyers have put together themselves. Put together rather nicely, but make sure you know what you're getting. Yes, the magic phrase is "Code 3". The seller has been completely honest in the description, just make sure you read and understand it. If it has been altered or adapted then there's probably been more care afforded to it than by a manufacturer. It looks like a very nice job anyway. Exactly. It probably has had more work put into it than an "official" release, ironically, but I wouldn't want anyone to pick it up thinking it's something else. Following in the vein of the dealer-created Lotus, some industrious soul has also gone and made a little version of Emily, complete with teeny tiny bowler on the roof (which I have to admit is pretty cute). 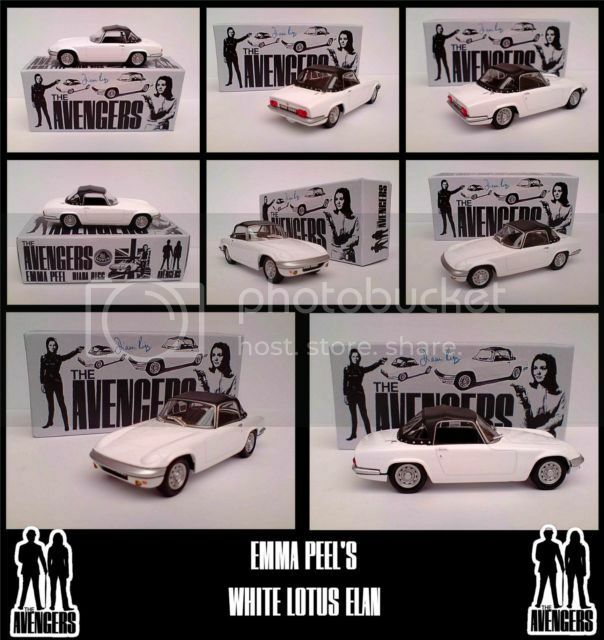 There seem to be lots of these made-to-order diecast Avengers cars floating around recently. I wonder if demand's up, or there are just a couple of dealers who specialise in these things suddenly getting on ebay. 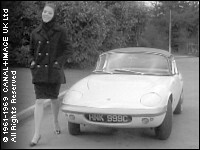 Emma Peel gets a mention in a new comic book about Lotus chief Colin Chapman. The following frame is from the current issue of Classic & Sports Car magazine. Coincidentally, I saw a copy of the poster featuring Jim Clark at the Goodwood Revival last weekend - together with the racing driver's own road car.